The redesign follows interface trends from Facebook, Twitter, and Instagram so Venmo is more familiar for first-timers, and puts the “Pay” button in the navigation bar so you can quickly settle your debts. 42% of payments on Venmo were already being shared, even though its news feed was buried deep in the app. Still, the startup has also notified users via email that payments now default to publicly visible to other Venmo’ers, which could alarm some. Will the redesign be enough to fend off PayPal and help Venmo go mainstream? And what can other startups learn from Venmo about turning their activity into content? Some other changes in the new Venmo include user profiles where you can see your payment history with a friend and “trust” them to instantly charge you money, a better find friends feature including the ability to find other Venmo users you aren’t socially connected to, easier payment composing, and a faster overall feel. While payments default to public now, you can easily switch them private in the settings or each time you pay. Some people might be uneasy about sharing Venmo payments, even though the apps give strong, persistent and ever-present controls. Scaring away some users is just the price Venmo will have to pay. Personally I liked Venmo as a utility first rather than a source of content, but the startup needs traction and the news feed could make it more viral. When users know the content they produce through the app has a place to be seen, they may be more likely to share, not just within an app, but to their social networks like Facebook, Twitter, and Foursquare as Venmo allows. Those shares can be crucial to pulling in new users. Co-founder Andrew Kortina tells me Venmo will succeed where apps like Blippy that automatically shared your credit card charges failed. That’s because the average credit card purchase to a merchant is boring, but Venmo payments to friends “naturally involve a social experience. They’re all the fun things you’re going to talk about with friends later, so they make pretty good content.” Depending on how creative your friends are, Kortina could be right. Most people I know stick funny notes about those experiences in their Venmo payment descriptions. When we split a cab ride it’s “$10 for the party express”, getting reimbursed for a vacation house is “$200 for infinite memories”, or when one person pays for a group dinner and we all Venmo them it’s “$25 for food coma”. But that’s an emergent behavior we learned from other early adopters that Venmo hopes will be transmitted through the news feed. A list of payments for “cab”, “condo”, and “dinner” isn’t going to challenge Facebook or Twitter as what you read in bed or on the bus. Venmo should make sure to use its power to control what public updates appear in everyone’s feeds to highlight the most interesting payments so new users learn the style. Venmo took a cavalier approach to this rollout, pushing to its full user base rather than testing on fractions of its user base. Other startups considering emphasizing a content feed rather than just the utility that generates that content need to get out of their own network and test with average or new users. They should also push design updates to portions of their user base and watch for usage fluctuations. Neither sentiment nor data can perfectly predict what a startup should do next, but they can be useful signals to combine with the hunches of the founders. Kortina says “PayPal was definitely an inspiration for Venmo, but we realized it got really popular because of eBay with payments between two people who didn’t trust each other. It wasn’t optimized for paying friends.” So Venmo is focused on getting social payments right where PayPal gets it wrong, and the news feed is a big bid for differentiation. Kortina also thinks Venmo will beat payment apps from banks like Chase by being bank-agnostic. And the startup has little interest in being acquired as some financial institution’s “social / mobile play” because the team wants to keep innovating. The company is staying extra lean working out of “cosy” New York office to make sure it doesn’t burn through its undisclosed volume August 2011 Series A from Accel, RRE Ventures, Greycroft Partners, Lerer Ventures, as well as past funding from angels like Dave Morin and Dustin Moskovitz. Eventually, though, Kortina foresees a business plan centered around users paying merchants like restaurants, and Venmo charging those merchants a small amount. Even grander, Kortina imagines that one day users could hook up their bank account to Venmo, and the app could then earn money for handling payments to other online marketplaces and saving them from credit card processing fees. That could turn Venmo into a payment layer for both virtual and physical purchases from Apple, Amazon, and more. For now, though, paying from a bank account will stay free, and the 3% charge on credit card-funded payments is just to cover the fees Venmo pays. 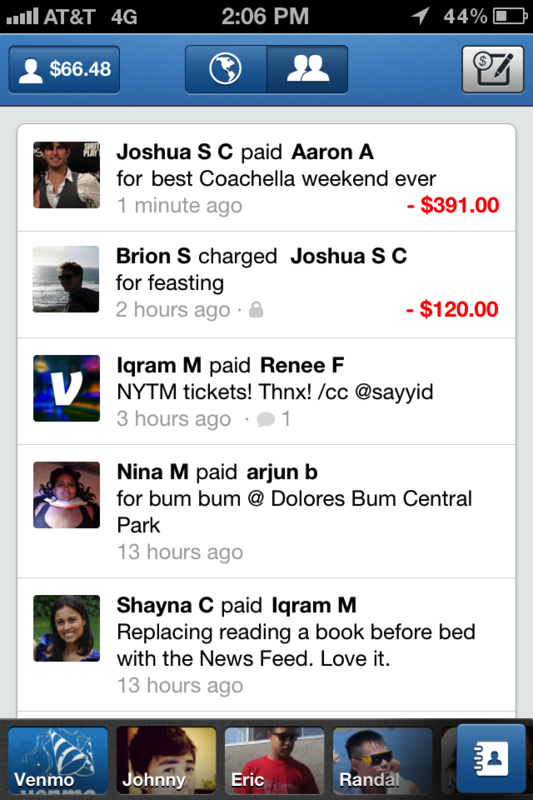 While the news feed is amusing, the core value of Venmo is that it just works. I can often pay a friend for half a cab ride faster than he can even finish paying the driver. Near field communication and waving your phone around might be the future of payments, but for now, nothing lets me ditch cash and pay friends for anything better than Venmo. 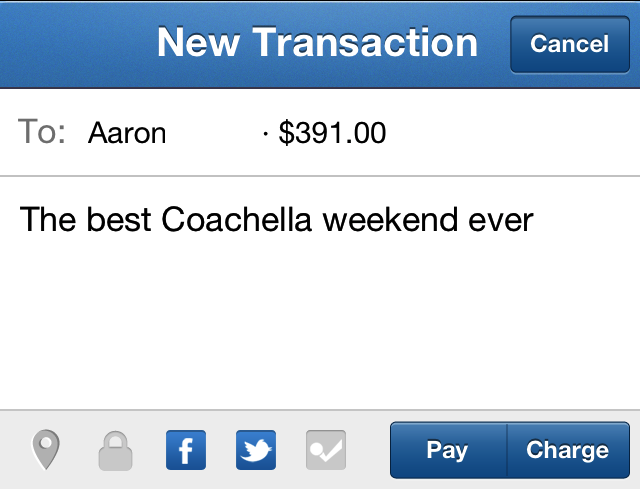 You can download the redesigned Venmo app here for iOS, Android, and BlackBerry.